Fancy slaying some dragons? Tomb robbing the undeads? Joining the thief's guild while destroying everything as a black sorcerer? Being a werewolf and even a vampire (no, not Twilight)? Then you will surely, if not obsessionally fall in love with Skyrim in an endless adventure around the carefully-crafted, Scandinavian-inspired land. First Impression? Holy mama WOOWW! 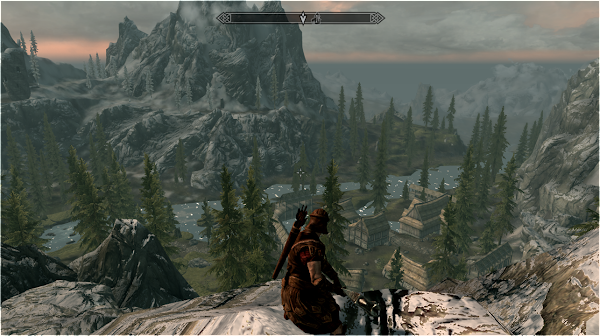 From the start, Skyrim offers an absolutely beautiful world, weaving together nature and war, history and fantasy. Flora and fauna energises the land with serenity while creatures and corpses heighten up the stakes while you unleash your skills as a dragonborn - someone who has the soul and blood of a dragon, with the ability to speak in the ancient dragon tongue. But before you think that Skyrim is just another RPG game with extraordinary visuals, think again. Though you are a dragonborn, and dragons are your strongest foes, the game is not only about dragons, and you are not merely a dragonborn. 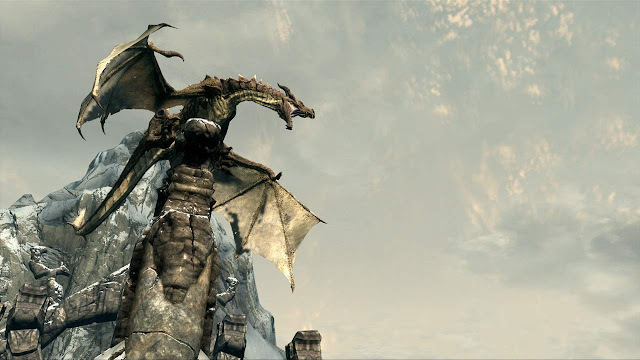 Tip: To land a dragon (much easier to kill), lure the ancient creature to a non-mountainous, empty land. True to the Elder Scrolls Series, Skyrim allows you to be any character you want, werewolf? lizard-faced? a beggar? No problem. On top of that, unlike many other games including its predecessors, your first decision on who you want to be will not limit you to what you can be during the course of the game. For instance, I am an Imperial and it excels in combat and magic. However, I decided that swinging a one-handed sword repeatedly while throwing some magic is simply too lame so I decided to go stealthy! You see, Imperials are (or rather look) big and inflexible, unlike the Khajiit race. However, as Bethesda removed the attributes feature, and only focused on skill trees and perks, I can be a thief and sneak behind opponents. So basically, with the attributes feature removed, the first character choice doesn't make much difference - you can change to whatever character you wish to in the future, bear that in mind. Destruction skills - my favourite! 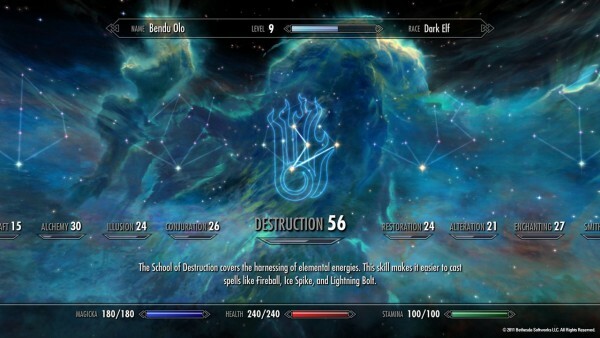 Though several skill trees were also severed (athletics and acrobatics), the intensity and pleasure one can get from the Elder Scrolls series is as limitless as before. The open world is free the explore as the game gives you the ultimate ability of controlling the path of the game. You do not necessarily need to follow the main quest; in fact, I would recommend you to join the Companions, the Theif''s Guild or the Magician's College straight after, or even before you finish your basic dragonborn main quest. However, unfortunately, dungeon quests doesn't give you as much freedom as they are dissapointingly rather linear. Well, you can opt to use your sword, a bow, magic, or anything you want to kill those creeps but the path to the final destination is basically a 'curved' straight road with occasional detours (for extra loot) and obstacles which you have to (read: will numbly) bash and slash your way through. On a happier note, it only applies to the dungeons so I'll forgo those quests unless, and until it is essential. Oh, do note that there are about 150 dungeons in the game. The size of the map omg! 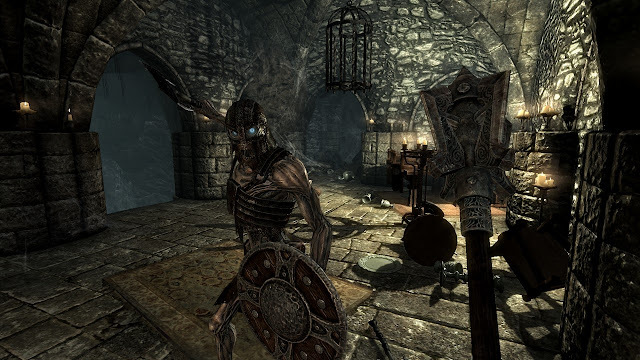 To conclude the review, Skyrim can easily be one of the strongest contender for the 2011's Game of the Year title. With its almost limitless platform and the extent of freedom and choice for players, one can spend hours and days and weeks on the game with ease, and never, be bored of it - which is kinda a bane but you know, who cares! This is Skyrim we're talking about! The possibilities, are immensely infinite.